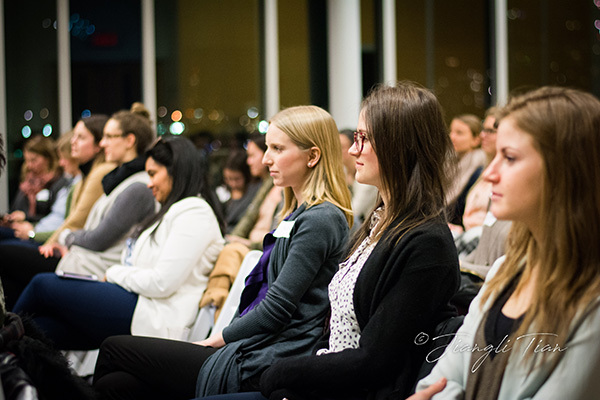 On February 22nd, despite the subzero temperatures, Vancouver members piled into the Creekside Community Centre to hear from our speaker panel on how to get to the next level in their careers. 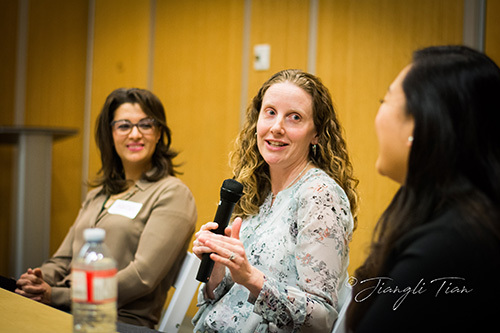 The diverse speaker panel showcased female executives from the entrepreneurial space, accounting profession, and real estate sales and marketing. Karina Hayat started her tech company with her husband 17 years ago in the health sector, and has been recognized with numerous accolades across Canada. Carly Bergman followed the natural path with her ambition to get to the next step, which eventually landed her as Partner at D&H Group. Linda Broda recounted her many years of experience in the real estate marketing industry as ‘dating’ various real estate developers, working on a project-by-project basis, and is now happily committed to one developer, Aquilini Development, as their Vice President of Sales and Marketing. The panel covered various questions relevant to women looking to ascend further in their careers, such as how to find a great mentor, whether the glass ceiling applies, and how they’ve managed to find work-life balance. There were many gold gems throughout the discussion, such as Linda’s note on finding a brutally honest mentor to help you get past your doubts and fears. “You need someone who can be honest with you. 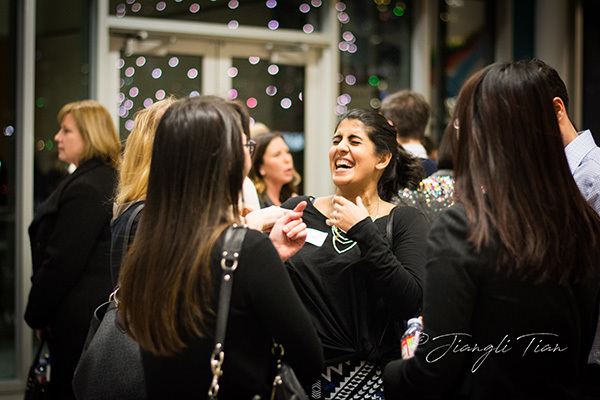 My mentor once told me to shut up and stop doubting myself.” Linda said as she recounted a conversation she had with her mentor when she was looking to switch jobs. The panel shared a consensus on the importance of harmony and respect within the household, and shared stories of how their other halves have supported their ambitions and career progress. Whether it’s spending more time with the kids and ensuring the family eats more than Cheerios for dinner (as in Carly’s case), sharing the household chores and responsibilities evenly (as in Karina’s case), or providing a down-to-earth haven away from the stress of work (as in Linda’s case), our female executives showed appreciation for how their husbands have contributed to their work life balance. What’s the next step after you earn a spot at the executive table? It would be to learn how to manage the financial wealth you have garnered. Our next event will center in on how to manage your financial wealth, with UBS Director of Wealth Management Jacoline Loewen leading the session. We look forward to seeing you in April!